The story of St. Labre can be traced back as early as 1897 when Pierre Poitras first came to the area in search of the gigantic forests he had heard so much about. Being quite impressed with what he saw, he quickly applied to the Government for forest limit of the area. That same year, the Great Forest Fire swept through the area. Knowing that the Norway Pine could be salvaged, Mr. Poitras quickly rounded up a crew and set up a sawmill. The opportunity of employment brought in many families from Quebec, Belgium, France, Germany and Switzerland over the next decade. In 1904, Mr. Poitras constructed a small chapel on SE 33-4-11EPM. The first school, Grenier School, No. 1446, was erected in 1910 to serve the growing population and soon after religious services were moved to this building as well. The St. Labre Post Office saw its beginning in 1912 and over the years the community was home to a Caisse Populaire and a general store, complete with hardware and fuel. In 1918 the men in the area started cutting timber for the church that still serves the area today. It was an elaborate project that took many years of hard work. Finally, in September 1928, Archbishop Beliveau blessed the completed building and named the new mission St. Benoit Joseph Labre. A convent was also built next to the church to house the nuns who were the schoolteachers at the time. To this day, St. Labre maintains a strong agricultural base, employing many people and making it possible for them to live and work in the area. Vast, fertile fields produce a variety of cereal and forage crops and the land is ideally suited to present and future dairy operations as well as the expansion of the beef cattle industry. The area is very popular with hunters because of its abundance of deer and bear. There are also a number of cottages in the area where weekenders can enjoy the natural beauty and serenity of this wonderful corner of the Province. Many enjoy exploring the trails by quad and snowmobile. 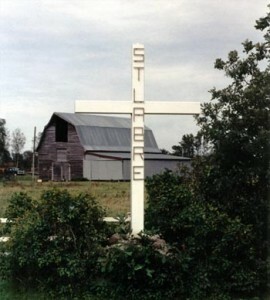 The area is also home to the St. Labre 200. This go-cart racing event is held each year in July, attracting a large crowd of participants and spectators. St. Labre Community Centre Inc.